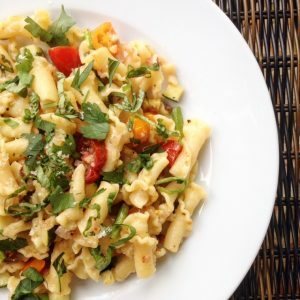 This summer pasta is light, delicious and bursting with an abundance of farmer’s market vegetables and herbs. A welcomed, bright change from the typical marinara sauce. Spaghetti, lasagna, fettuccine, ravioli, gnocchi…I haven’t met an Italian dish with pasta that I didn’t like. Ever. I love pasta. Every year for my birthday in January, I request Italian sausage lasagna with marinara sauce, bread to dip into parmesan cheese and olive oil, along with a nice big, fresh salad. This dish is my special birthday dinner and my perfect winter time comfort food. Here in the Midwest, summer is in full force and I’m dreaming of my winter birthday dinner. I’d love to indulge in rich, wintry comfort foods, however my bathing suit, shorts, tank tops and skirts say, “no way!” So, my local farmers market was the answer. To create this summer pasta, I chose fresh and colorful vegetables. A bounty of fresh zucchini, slender asparagus, savory shallot, garlic, sweet heirloom cherry tomatoes, fresh basil and parsley went from farm-to-table all within a day. And, what a difference that makes! Ingredients I already had at home included peppery arugula, pancetta, “trumpet-shaped” campanelle pasta, slightly salty pecorino romano cheese and the makings of a bright and lemony vinaigrette. Start with bringing a large pot of salted water to a boil. Add pasta and begin to cook per instructions on the box. Meanwhile on the stove top, using a large sauté pan, set heat to medium and sauté pancetta with a wooden spoon until crisp, about 4-5 minutes. Transfer pancetta to drain on a plate lined with paper towel. Reserve grease in pan. Add shallot to the same pan and on medium heat, sauté for 3 minutes or until soft. Toss in garlic and sauté for another minute. Add in zucchini and asparagus and sauté for about 5-6 minutes. Turn heat off and set aside. Drain pasta yet reserving ⅔ cups of pasta water. With heat set to medium-low, add pasta back to the large pot along with the reserved pasta water and arugula and stir together. Add in veggie sauté to pasta and stir to combine ingredients together. Pour in vinaigrette, add pancetta and cheeses and continue to stir until ingredients are redistributed. Plate pasta and add the basil, parsley and course sea salt on top to finish. Add in tomatoes and sauté for an additional 3-5 minutes or until tomatoes begin to soften. Purchase Herbal Fusion here to make the Lemon Vinaigrette for this dish. Herbal Fusion is also delicious mixed with olive oil and parmesan cheese and used to dip bread in. Use Herbal Fusion in any tomato sauces (homemade or jarred variety) to add savory flavor. Also, check out our Caprese Orzo Pasta with Greens and Olives as a side dish.